Lies, gaffes, and half-truths: Do voters care? Whether it’s a Freudian slip, debate aphasia, or evidence-free assertions, presidential candidates have a reputation for putting their feet in their mouths. Presidential candidates have a reputation for putting their feet in their mouths. Sometimes it’s a Freudian slip, as when Hillary Clinton said former presidents shouldn’t have to disclose their criminal records (she meant prisoners). Other times, it’s an embarrassing moment of debate aphasia, like when Ted Cruz declared he’d eliminate five federal agencies, but could only name four (an uncanny echo of Rick Perry’s “oops” moment in 2012). Then, of course, there are the evidence-free assertions and outright lies. Mythical tax cuts that will supercharge our economy. Repeated claims that Mexico is deliberately sending murderers and rapists across the border. Tales of horrific footage from a Planned Parenthood video — when that footage doesn’t seem to exist. The 2016 campaign has it all. But does any of this even matter? Do candidates pay a price for their gaffes and lies? Or is it just a fun gotcha game for political insiders with little actual impact on voters? How truthful were these candidates’ statements? 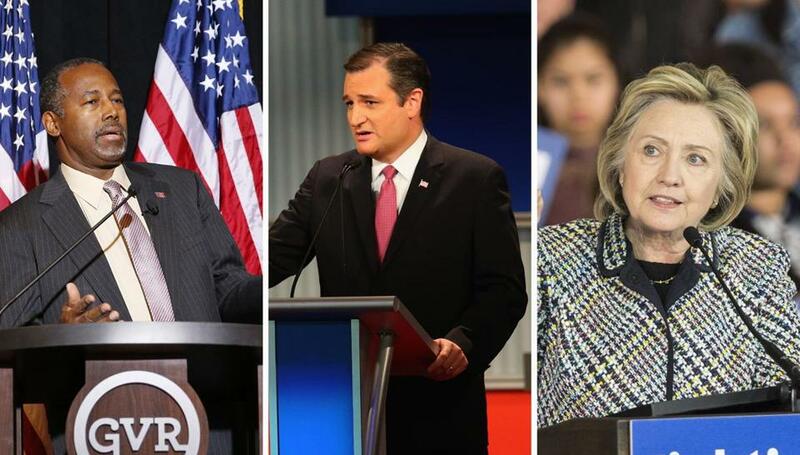 Candidates in the 2016 presidential race have said some outrageous, unlikely, and unfortunate things. In the end, there really isn’t much evidence that gaffes hurt candidates. Quite the opposite: Sometimes they can boost a candidate’s exposure — and support. No doubt, there have been some game-changing gaffes in American politics. But these defining moments are the rarest of needles in the haystack of overhyped gaffes that turn out not to make a big difference. Consider some of the high-profile presidential gaffes in recent general elections: John McCain’s crisis-blind insistence that “the fundamentals of our economy are strong,” or John Kerry’s long-echoing statement that he voted for a war-funding bill before he voted against it. Both these candidates lost, it is true, but was it really the gaffes that did it? Dartmouth College political scientist Brendan Nyhan is one of many who have pointed out that the races turned out very much as you’d expect, based on established political science models that look at election-shaping “fundamentals” like how fast the economy is growing and which party is currently in power. “Both George W. Bush in 2004 and Obama in 2008 performed approximately as well as election forecasting models expected, which suggests that these campaign events had limited influence,” Nyhan wrote. If anything, this year’s candidates seem especially immune to gaffe-consequences. Particularly on the Republican side, where the political scrum is quite pugnacious and where the threshold for political embarrassment feels unusually high. Early in Donald Trump’s campaign, for instance, every fresh statement from the brash candidate seemed to portend doom, whether it was his unflattering talk of Mexican immigrants or his insistence that being captured and tortured didn’t make McCain a war hero. But even as the media prepared Trump’s political grave, the candidate pressed onward and upward in the polls. More recently, Ben Carson has drawn attention for his own brand of controversial hyperbole. Several of the stories in his published biography seem to be exaggerated, if not invented, including claims about his violent acts as a youth. To be fair, this doesn’t mean Carson is lying 80 percent of the time. 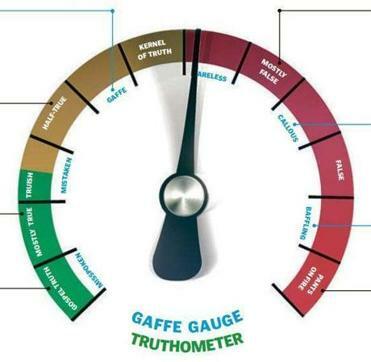 PolitiFact is more likely to evaluate controversial claims, which means it will pick up many of the exaggerations that pass a candidate’s lips and fewer of the straightforward truths. Still, PolitiFact brings that same standard to all the candidates, and Carson still stands out. Trump, too, is at the high end. Of the five dozen Trump-uttered statements PolitiFact has checked since this summer, over 75 percent turned up some version of false. Cruz is the next closest, with a 67 percent false rating, from a smaller sample of 18 controversial claims this campaign season. Among other top candidates, US Senator Marco Rubio, former Florida governor Jeb Bush, former US secretary of state Hillary Clinton, and US Senator Bernie Sanders all have cleaner PolitiFact records, with outright falsehoods strongly outnumbered by truthful statements. Suffice it to say, then, that on the Republican side, there doesn’t seem to be much of a correlation between what PolitiFact has to say about candidate honesty, and the current state of the polls. Why aren’t candidates hurt by gaffes and lies? There are lots of reasons that ill-considered words don’t always matter. For one thing, not everyone hears them — or realizes that they’re gaffe-material. During the Republican debate on CNBC, Trump was asked why he called Rubio “Mark Zuckerberg’s personal senator.” Not only did Trump deny having ever made such a statement, but he attacked the journalist who asked the question and extracted a quick apology. In truth, Trump was completely wrong, having called Rubio “Mark Zuckerberg’s personal senator,” on the immigration policy page of his campaign website. But few who saw the exchange even realized that it might qualify as a gaffe. And when the moderator tried to bring it up again later in the night, after having confirmed his facts, the correction seemed a kind of afterthought. Trump had benefited from a kind of debate loophole: Whereas the standoff comes first, and feels vital, the fact-checking takes time, and often seems an afterthought. This strategy really does seem to work, regularly keeping gaffes and flip-flops from being spotted. But even when it fails, and the gaffes get loose, that’s not necessarily bad for the candidate. Controversial statements generate big headlines and lots of media attention, which not only make for free publicity but can actually boost candidates’ stature, by making them look worthy of controversy. One reason bad publicity may not be damning is because savvy candidates know how to twist it around, using the slightly depressing but well-known psychological phenomenon called the “backfire effect,” well-documented by Nyhan. Sometimes, when presented with information that challenges your strongly held beliefs, you actually double-down, strengthening your conviction, Nyhan argues. So supporters of Carson, confronted with recent stories about the lack of evidence behind parts of his personal narrative, may not be moved to reconsider their position. Instead, they may rush to Carson’s defense, contending their favored candidate is being unfairly targeted. Carson himself has been fanning these flames, insisting that he’s being subjected to an unusual and unfair amount of media scrutiny. Will today’s candidates ever pay a price for their gaffes? Maybe not. Comforting as it may be to think the truth will ultimately triumph, and the most competent candidate win the day, big lies and defiant gaffes sometimes make for good political strategy. They garner attention, which candidates need, and they allow candidates to position themselves as outsiders in a hostile media environment, political rebels in a world of tainted, traditional politicians. Then again, there may be less to this than meets the eye. All Trump’s and Carson’s success has really shown is that eccentric statements don’t always hurt polling numbers. But who cares about polling numbers? At this point in the campaign, polls are extremely unreliable. Look instead at other, more reliable measures — like endorsements or prediction markets — and you find the tighter-lipped, establishment candidates currently in the lead. Correction: An earlier version of this story misidentified the name of Dartmouth College.